So I realized recently that when I wrote my 30 Before 30 list, I intended to add colors to my Converse collection, and take pictures of my adventures in them. 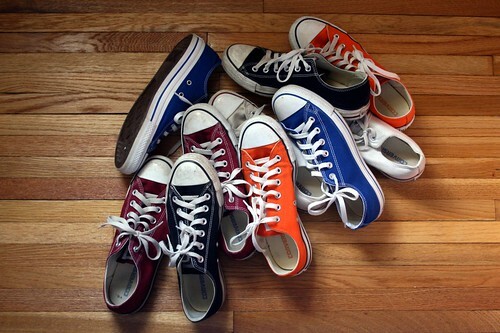 Since my birthday last summer, I have bought royal blue chucks, and I wear them all the time. But since we’re nitpicking rule-followers here at she likes stripes, and my original list item said to add colorS to my collection, I think it’s about time to add to the family. And since I can’t make decisions on my own, I need you to help. Here’s a reminder photo of the colors I already own: black, white, maroon, orange, and royal blue. Now keep in mind – the eventual goal (because I dream BIG) is to own all the colors, no matter what my boyfriend thinks. 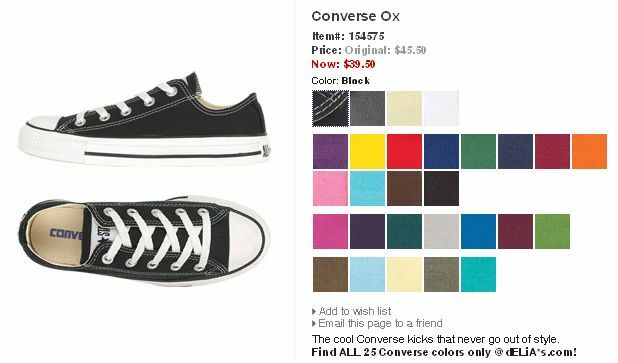 (He previously vetoed turquoise chucks because he didn’t want to date someone who wore Smurf-colored shoes. Tough luck, buddy!) It seems like Delias of all places has the best, cheapest variety, so first, click over there to see all of the colors they have. Now! I promise to buy the color that wins this vote. I’ve narrowed it down to six finalists. Which color should I get? This entry was posted in 30 before 30, life, photography. Bookmark the permalink. omg, this is the most fun poll ever!! !